With increasing number of working days lost to back problems and repetitive strain injuries, the demand for better office seating has never been greater. The Platinum Ergo provides positive posture support through a combination of features enabling you to - Sit in the chair not just on it. UNIQUE BACK DESIGN - Provides support to both the upper and lower spine areas with one touch ratchet back height adjustment. REFLEX SEAT STRUCTURE - Extreme comfort, consistent shape retention, durability & long life, plus excellent fire retardant properties. ISB - Independent seat and back adjustment with body weight tension control (/3) TENSION ADJUSTMENT - Backrest counter pressure. GAS SEAT HEIGHT ADJUSTMENT - 150 Kg (25 stone). CASTORS - Twin wheel hooded. FIVE STAR BASE - Black nylon as standard. 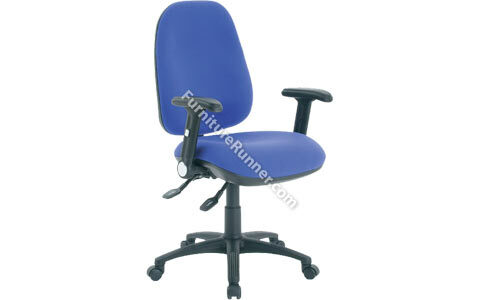 Comes complete with A13 height adjustable and fold down arms.